K. Ullas Karanth, Ph.D., F.A.Sc. - Conservation Heroes - Banovich Wildscapes Foundation, nonprofit (501c3) organization fostering cooperative efforts to conserve the earth's wildlife and wild places benefiting the wildlife and the people that live there. K. Ullas Karanth, Ph.D., F.A.Sc. Ullas Karanth's geographic area of work is the Western Ghat region of India, which is one of global biodiversity hotspots. He was born (1948) and raised in the Malenad landscape of this region. His special area of scientific passion and expertise are animal ecology, population dynamics and statistical ecology. Karanth has also been an active advocate for wildlife conservation by guiding local advocacy groups to mitigate threats to wildlife and habitats. He has skilfully piloted conservation models that realistically reconcile conflicting needs of wildlife conservation and human development in, crowded, aspirational India. 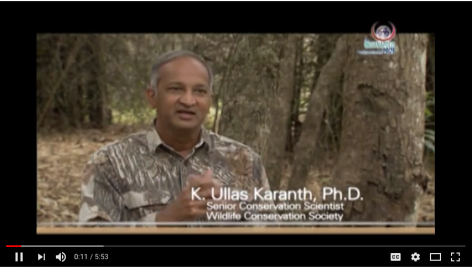 K. Ullas Karanth, Ph.D., is a senior conservation scientist with the Wildlife Conservation Society and premier tiger expert. He energizes the new generation of India's conservationists and has championed the cause of tigers through his groundbreaking work in India, Thailand, Malaysia and Indonesia. After two decades actively involved in tiger conservation, Karanth still finds room for optimism: "We have experienced successful tiger conservation actions in India, including a voluntary relocation of villages, the closure of a destructive mine, and a campaign that lead to the termination of a failed eco-development project in Nagarahole."